My aunt lived an exceptionally full life. Although her husband died early in his sixties, she just kept on going, and lived disease-free for another three decades! Mother of two children, and grandmother of two more, she was still traveling with her daughter, attending social functions, and acting as treasurer for her church well into her eighties. Whenever I saw her, she invariably sported a big, bright smile, and her walk had a lively bounce in it. She was sharp as a tack up until the very end, when liver cancer finally felled her. She lived just two months after the diagnosis, and died in a bed surrounded by her loved ones. I think we’d all love to live a life like that. What exactly did she do to grant her that gift? No one will ever really know for sure, but I do know she generally tried to follow all the recommended advice. She ate her vegetables, she exercised daily, she watched her weight. And then, I suppose there was probably a little luck thrown in as well. Experts say that we can all live a life as healthy and full as my aunt, as long as we are careful with our daily choices. 80% of our lifespan is lifestyle determined. This means the daily choices we make now can have a phenomenal effect on how long we live, and how well we live as we enter old age. Back in the year 2000, scientist Michael Poulain set out to find and catalogue the areas of the world where centenarians seemed to concentrate. He called these areas Blue Zones, and they included now famous places like Okinawa, Japan, and Sardinia, Italy. He went to each of these places, interviewed the centenarians there, and then watched how they lived and what they ate. He wanted to determine what had led to their extended lives. 9) Have faith. It doesn’t matter what you believe in – just believe it! Sadly, it seems that as a more modern way of life is entering these mostly poor, rural Blue Zones, their life expectancy is shortening. The children and grand-children of these exceptionally healthy centenarians are experiencing higher rates of obesity, high blood fat, heart disease, stress, and cancer after having taken up a more meat-based diet, and using cars or mopeds instead of walking. 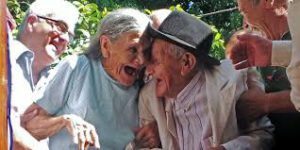 Researchers predict that after the current crop of centenarians dies, more average life-spans will most likely predominate there. Poulain now thinks that the extreme longevity he discovered in these Blue Zones may have been a temporary “generational phenomenon”. When these centenarians were young, up to 20% of their peers died due to disease or accident, leaving only the strongest and healthiest alive. After an old-fashioned, physically demanding childhood, they then grew up to have access to modern medicine, which helped to extend their lives. Nevertheless, their lifetime experiences still offer us extensive information on how our diet and exercise choices can affect our long-term health for the better. For example, all the diets in the Blue Zones were plant based. Not only did they eat plenty of vegetables, but they also socialized often and walked everywhere. Now, committed Blue Zone communities, like Spencer, Iowa are popping up in the US, where all citizens vow to eat a plant-based diet, marginalize junk food, walk more, and join moais, or programmed social networks. Remarkably, over the course of just one year of following these new rules, the healthcare costs for city employees dropped by a whopping 25 percent. If we’re determined to make the right choices for our health, and with enough luck, we should all be able to live a life like my aunt did. All we need is the will to do it. It would take effort, and change, but if we all support one another, I believe we can change our societies for the better. We can create more pathways for walking, provide more parks and plant more trees. We can add higher taxes to junk foods to make them less attractive meal options, and ensure there are more grocery stores than fast food outlets in food desert communities. We can also take the time to really get to know our neighbours and expand our social networks. The facts are already in: not only will this help us live longer, it’ll decrease healthcare costs as well. I think these are things that everyone wants. About the author: Rebecca Wong has been working in the herbal business since 2000. She has received her training in acupuncture and herbalism from respected authorities Paul Des Rosiers and Vu Le at the Ontario College of Traditional Chinese Medicine in Toronto, and Michael Tierra at the East West Herb School in California. Previous PostTake the Time to ReadNext PostIs There a Limit to the Human Life Span? I have part of your Liver functions, liver disease, and liver cleanse and would love to have the whole article which is dated 8/16/2013. Thank you.